Spotify vs Joox: Do We Really Need Another New Streaming Service? When talking about music preferences with my Asia friend one day, I am surprised to hear that she'd prefer Joox to Spotify. As a Spotify fan, I didn't hear much about Joox before. Isn't Spotify the most popular streaming service the world? What are the advantages of Joox? Do we really need another new music Joox? With all these questions, I spent much time to research the difference between Joox and Spotify. If you also have similar questions, please follow this page to check the full review. It will definitely help you made up your mind better when picking up your music. 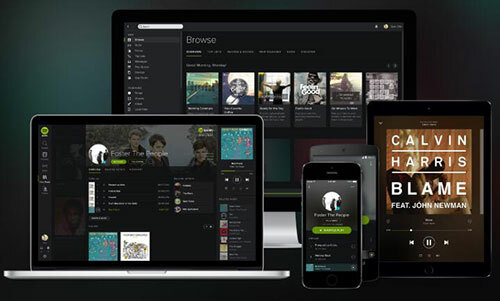 Spotify is the pioneer and king of streaming music developed by Swedish company Spotify AB in 2008. It provides DRM contents songs from record labels and media companies for over 78 countries. It is especially popular in Europe, America, Australia, New Zealand. Spotify has over 40 million songs, 200 million monthly active users and 87 million paying subscribers. It is well-known for its fantastic music discovery feature which recommends you songs by using your listening data. Joox is a new streaming music service launched by Tencent in 2015. It is not as big as other mainstream service Spotify, Apple Music, Tidal in the world, but it is the largest music app in Asian markets such as Indonesia, HongKong, Malaysia. In 2017, Joox launch their service in South Africa. It has about 100K songs and over 2 million in total. The best part of it is that it provides customized local music. Here you’ll find all the gqom and kwaito you’ll ever want. And the music is free without annoying audio ads except some banner ads. If you are new user of of streaming music or you are considering to switch to another platform, you should definitely find out the details before you put your money to it. 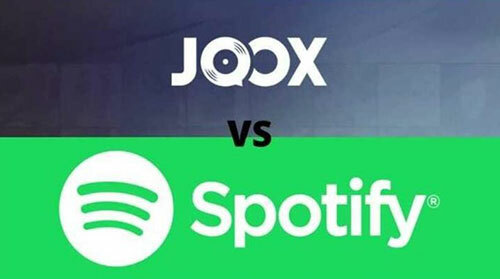 Now you can check the detailed difference between Joox and Spotify. Spotify has the best music discovery feature such as daily playlist, weekly playlist. The app can automatically analyzed your listening data so that to recommend you the songs which will meet your music taste perfectly. Joox has the great recommendation features too like Featured Artists, Radio， Editor's Picks, New Release. These playlists are generated by professional editors based on the local trends on social media and so on. Spotify offers 160Kpbs quality for free users and 320Kbps quality for premiums users on desktop. For more more about Spotify bitrate, you can visit: How to Increate Spotify Bitrate. There is not an official announcement on the music quality of Joox. But it is recognized that it is a little bit lower than Spotify music's quality. Both Spotify and Joox provide free service. Joox has 30 days free trial. After that, you can continue to share a song to your Facebook or Wechat to extend the Premium/VIP period. Spotify only offers 7 days free trial. When it ends, you will need to pay for it if you want to continue. For the Spotify Premium, it costs $9.95/month for single user and $19.95/month for a family license for up to 6 users. Joox Premium costs RM14.90/month which is much lower. Spotify library has over 40 millions which is much larger than Joox's 1 million songs. But Joox also has its strong point. It has the best local songs. Take Malaysia for example, you can easily find the Malaysican male singer, female singer, group.band and the latest hits in the world. Both Spotify and Joox premium subscriptions offer friendly user experience. But if you are using the free accounts, this is a little different. Spotify will have audio ads time from time, your listening will be interrupted. Joox doesn't have such ads except the banner apps, so you won't have such kind of trouble. If you'd like to remove ads from Spotify music, you can also use the DRmare Music Converter for Spotify to help you download the songs and playlists offline. Spotify has joined forces with Genius to give you access to the lyrics and the story behind the song. It works on the Android and iOS app but not the desktop client. Joox has the most eye-catching feature lyrics feature. It works on web player, mobile apps and so on. It will hightlight every phrases one by one. This is very useful when you want to sing along with the songs but forgot about the lyrics. Spotify provides all kinds of apps for desktops, mobile devices and web player for any devices with Internet connection. Besides, Spotify has cooperated with many third party device manufactures such as Roku, Google Chromecast, Sonos to integrate the app. Joox only has the mobile apps and web player. But its apps are with perfect customization theme gallery. Both apps supports local music playback. You can import local songs to Spotify app as well as Joox. Part 3. Spotify or Joox: Which One Should You Choose? Now you have learned more about the two great streaming music. Both can help you import local songs, create playlists, discover and play music you like. 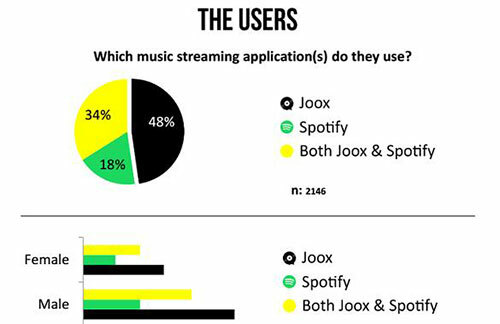 According to a survey, much more users prefer Joox better than Spotify in Asian countries Indonesia, Malaysia. Spotify music is the mainstream steaming media platform. With its large music library and high audio quality and a lot of great features such as music discovery, it will meet your need perfectly. It costs $9.95/Month which is higher than Joox. If you don't care about the money, Spotify is your best choice. Joox is not as well-known as Spotify. As a new streaming source, its music collection, quality, users are low, but it is keeping growing fast especially in Asian. Besides, its great local customization contents and low premium/VIP costs make it attract a lot of local fans. You should give it a try if you enjoy Asian, Africa artists. Still have any questions? Please feel free to leave your comments below, we will do our best to help you.